In response to the increasing pressures and stress of urban life, Royal Botanic Gardens Victoria has launched three meditative Wellbeing Gardens, to encourage people to take time to relax and recharge in the peace of nature. Fern Gully has been an iconic part of Royal Botanic Gardens for over a century and in 2016 a much-needed restoration project was launched in Fern Gully. This project aimed to improve the health of the plants, restore the water flow and improve access so people could really enjoy the space. Although each Wellbeing Garden is unique, all three were designed for small groups and individuals to visit and find a restful, restoring environment. As visitors move through Fern Gully along the boardwalk, these spaces give guests the opportunity to stop, pause and reflect. The Wellbeing Gardens can be accessed via a series of secondary paths that loop back to the main boardwalk. Brought to life by the generous assistance of three donors, these spaces were tailor-made to reflect the personal stories of each supporter. Andrew Laidlaw, Landscape Architect, partnered with the donors in his design, helping to translate their stories – all of loss and memory – into the landscape. The Bird’s Nest is a playful hideaway where guests can observe the world around them from a suspended swing seat. Inspired by a love of birds, the area is fashioned around a large Ficus tree nestled within a sculptured bird’s nest and arc of tree ferns, both richly planted with Bird’s Nest Ferns and native orchids. The Bird Nest artwork (which uses timber sourced from around the gardens) and swing, which was inspired by a chrysalis, were designed by David Wong, in close partnership with Andrew Laidlaw. Building on an existing heritage listed rock feature within Fern Gully, the Grotto is a peaceful place to sit quietly, isolated from the rest of the gardens. Designed in memory of the donor’s late husband and using stones from their property in Dunkeld, the space is cool, calm and serene. The garden is sheltered by an intricate wrought iron artwork by artist Justin Purser, and contains a simple water feature adding sound and ambience to the space. Embedded in the rock formation are lichens and historic pieces of crockery and china discovered by the staff from and around the gardens, left behind from the ghosts of picnics past. The Moss Garden offers an intimate clearing to gather and share in nature. It is reminiscent of a Japanese garden, with three sculpted stone seats, carefully placed around the central ‘mother stone’. Symbolising the well spring of life the gentle bubbling water creates a nurturing soundtrack to this beautiful space. The stone seats and ‘Mother’ stone were sensitively sculptured by Ashika Ostapkowicz, symbolising the donor’s loved ones who have passed away. “The Gardens have long been a place of respite and relaxation, and we are delighted to add to this experience with the launch of our Wellbeing Gardens. 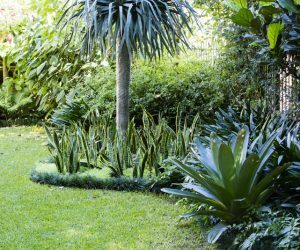 Designed to intrigue and entrance, these small garden spaces offer a whole new way to enjoy the calm, lush setting of our Fern Gully. Yet another way to immerse yourself in nature at the heart of the city.” – Royal Botanic Gardens Victoria Director and Chief Executive, Professor Tim Entwisle.